Varnae is a Marvel villain. He is considered to be the oldest Vampire lord in the Marvel universe. Varnae has battled many heroes over the ages including Kull, Conan, Red Sonja, Thor, Brother Voodoo, Blade and Doctor Strange. Varnae was part of an ancient group of Altantean sorcerers called the Darkholders. These sorcerers were masters of black magic specifically the spells held the legendary Grimoire the Darkhold. At this time there were multiple vampires within Atlantis. Varnae was wounded in a battle with Kull, and to keep him alive was turned into a vampire. Atlantis suffered a great Cataclysim that destroyed it and nearly its entire populace. One of the few survivors of Atlantis was Varnae. Varnae was the only vampire from Alantis to survive making him the oldest and most ancient of vampires. After the fall of Altantis Varnae traveled the world and created many more vampires. As the ruler of vampires he faced off against heroes such as Conan, Red Sonja and Thor. He ruled as the Lord of vampires for millennia but grew tired and weary of existence. He began seeking a successor to take control of his evil empire. Varnae found the cunning, gifted and intellectual Dracula and forced the younger vampire to drink his blood. The blood from Varnae coursed through Dracula and made him stronger while also imparting knowledge of ancient mysteries. Varnae also gave Dracula the Dark Hold the preeminent grimmoire of dark magic. After anointing Dracula with new powers Varnae committed suicide by walking out into the sunlight destroying himself. Many years later Varnae would be reawakened. 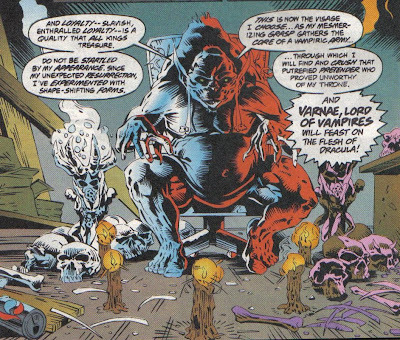 Doctor Strange had effectively exterminated vampirism using the Montesi Formula. The Voodoo Queen Marie Laveau required vampires to remain young as the blood of a vampire was a crucial component in Cagliostro Immortality potion. Laveau first attempted to go back in time to acquire the blood of Dracula but this failed. She then kidnapped Doctor Strange's brother Victor Strange and Morgana Blessing. She demanded that Strange provide the spell from the Book of the Vishanti that could restart vampires the Vampiric Verses. In the end Doctor Strange refused. Laveau then turned to an alternative she brought Varnae back to life. Initially, Laveau tried to control Varnae but he was far too powerful and merely laughed off her attempts. He then tried to feed but Morgana Blessing but was stopped by Doctor Strange. Doctor Strange caste an "Incantation of Oblivion" spell on Varnae that forced the elder being to re experience its oblivion. Varnae was stopped but fled. He said that Doctor Strange provided him him with a worthy adversary and a reason to live. While Laveau's attempt at controlling Varnae failed she did get what she wanted. Varnae went around the world creating new vampires and effectively fully eroded the power of the Montesi Formula. Even Dracula was eventually able to return. Varnae was hunted down by Blade and killed again. Varnae has the basic vampire powers but all to a greater extent than a normal vampire. He also possesses the vampire weaknesses of silver, garlic, holy symbols and sun light. Varnae has many life teams worth of experience. He is a skilled fighter, general and is considered to have a genius level intellect.